← Wild Oklahoma Grizzly Bear! 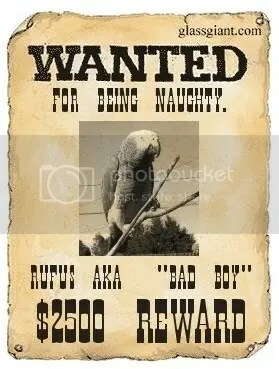 Rufus is a really naughty boy. He does not care what his naughty behavior gets him. Apparently, being naughty is its own reward. In the evening, we bring our two African grey parrots into the living room while we watch TV or a video. Peanut Boy wants to be with my hubby and happily sits on his shoulder. On the other hand, Rufus just wants to wander around the room tearing up stuff. We did have a three strikes you’re out rule before putting him back in his house, but we have lowered that to a one strike you’re out rule, with no effect. Rufus would rather be naughty for a minute and put back in his house than behave himself and be out in society.